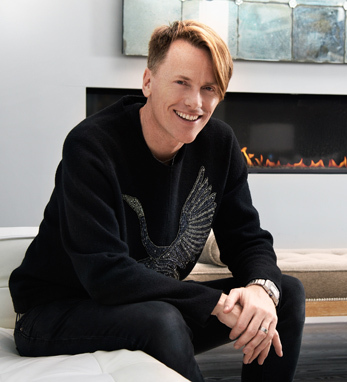 Don O’Neill is the creative director of Theia, an evening wear and bridal collection he founded in 2009. Previously, he served as the creative director for Carmen Marc Valvo and Badgley Mischka Platinum. Don was bestowed an Honorary Doctor of the Arts by University College Cork in 2015. In April he was voted Ireland’s Favorite Designer at the Peter Mark/V.I.P. Style awards in Dublin, and at November’s Irish Tatler Man Men of the Year Awards, Don won the International Man of the Year award. Don was born in the seaside town of Ballyheigue, County Kerry, where his parents ran a bed and breakfast. He studied at the Barbara Bourke College of Fashion Design in Dublin before working in London and Paris. The incredible Atlantic vistas from his childhood home in part inspired his creativity, and he says his Irish heritage and west coast upbringing have very much “informed the man and designer I am today.” He and his husband, Pascal Guillermie, were married in Ireland on June 11th, 2016 and live in New York City.